Google has been doing better bringing readers, who are using the correct blog URL, successfully to my blog. I have started a new month, so I will be using the bookmark link to the November 2014 archive for access: Stocks, Bonds & Politics: November 2014 That link will take anyone to the most recent post published during November. The October archive link will simply take me to the last post in October which is no longer the most current post. I will start using the blog URL when and if Google can consistently bring me to the blog page located at Google's own blogger website. The Federal Reserve has finally decided to end QE3 effective this month. Federal Reserve issues FOMC statement--October 29, 2014 The Fed believes that "economic activity is expanding at a moderate pace" and labor "market conditions improved somewhat further". Labor market slack is "gradually diminishing". The FED anticipates that ZIRP will "likely be appropriate" for a "considerable time following the end of its asset purchase program this month". My position in the SAN common shares are viewed as a long term contrarian investment for the reasons stated in prior posts. I have one reader who will focus all of their comments, either here or at SA, on an investment that does not immediately pan out, making what I would generally characterize as gratuitous drive by hits. Nothing is ever said about those that work soon after purchase or over the long term. Any comment that thanks me for the effort put into these posts would be totally inconsistent with that person's character. As I have noted in the past, I am fine with jerks ceasing to read my posts altogether and to vent their life's frustrations elsewhere. The ordinary shares are priced in Euros and trade in Madrid. The price had closed a €6.86 on 10/29. Company Description: I recently discussed this company when I bought a 50 share lot. Item # 2 Bought 50 SAN at $9.73 (9/6/14 POST). I would just refer anyone interested to that post. I am reinvesting the dividend to buy more shares which avoids Spain's withholding tax. Banco Santander S.A. ADS (SAN) went ex dividend for its quarterly distribution on 10/15/14. That dividend will be paid on 11/13/14. NASDAQ shows the total dividend paid in 2014 at $.80577 per SAN share. At that rate, the dividend yield is about 9.37% at a total cost of $8.6 per share. 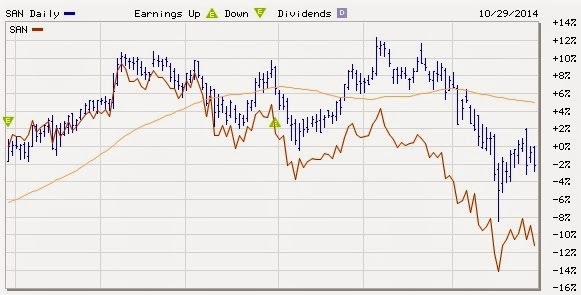 Part of the SAN price decline can be attributable to that currency issue, as shown in this 6 month chart comparing ES:SAN (ordinary shares traded in Madrid and priced in Euros) and the ADS SAN priced in USDs. I am using the Marketwatch symbol for the ordinary shares here. The decline in the Euro will flow through into the price of the NYSE listed SAN shares causing them to underperform the Euro priced ordinary shares. There really has not been any negative news, specific to Santander, that would have caused the ordinary share price decline. SAN.MC Interactive Chart The chart does appear to have formed a double top formation near €7.9. My take on Santander is that there is long term recovery potential. The non-performing loans were still hovering over 5% as of 6/30/14, 2Q2014 Results: Santander made a profit of EUR 2.756 billion, 22% more than the first half of 2013. The next earnings report is scheduled for 11/4/14. The consensus SAN E.P.S. for the 2014 third quarter is €.12 per share, up from €.10 in the prior year. I retrieved that estimate from a Dow Jones news release out of Frankfurt, Germany dated 10/29/14. Most of the estimates originate from foreign brokerage firms and banks. When I last bought shares, the 2014 consensus E.P.S. estimate was $.62 and is now 1 cent lower after rounding the USD number. SAN Analyst Estimates The current 2015 consensus estimate is for $.78, down from $.8 when I last discussed a SAN share purchase. 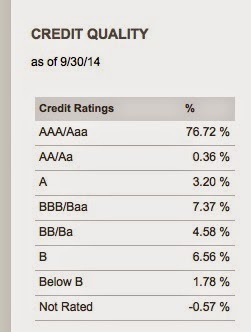 Related Trades: I have done well with SANPRB, a floating rate preferred stock. I use two examples to highlight this risk. One is the BDC HTGC and the other is the CEF PTY. I am now on an irregular publication schedule. Some trades will be discussed here and some individual trades will be discussed at SA. Google's software has inexplicable increases in the font size in this blog that can not be changed by any means known to me. I consequently quit writing it. The VIX remains in a Stable Vix Pattern. The brief spike to the mid-20s was insufficient to generate a Trigger Event under the Model. The 10 year TIP break-even spread closed today at 1.91% and has been trending down. That forecast is known as the break-even spread, the average annual rate of inflation for the owner of the 10 year TIP to break even with the owner of the non-inflation protected treasury. UPS is predicting a 11% Y-O-Y increase in shipments for December. Fitch reported that current credit card delinquencies are 18% lower than a year ago. Third quarter UK GDP rose a non-annualized rate of .7%. Consumer confidence rose to 94.5 from 89 in September, a seven year peak. As noted previously, I am in the process of transferring my LXP position solely to my Fidelity Roth IRA for the reasons given in South Gent's Instablog - Posts on LXP | Seeking Alpha. As noted in that post, I am receiving a 5% discount currently on the reinvestment price through Fidelity's indirect participation in the LXP DRIP plan. By owning LXP only in a Roth IRA now, I also avoid the artificially created income generated by receiving a discounted rate on the reinvestment price. As shown in the snapshots contained in that SA Instablog, the amount of the discount was added to the dividend, creating artificial dividend income, and consequently the cost basis was also increased to reflect the artificially created dividend income. I still own almost 55 shares bought in a Vanguard Roth IRA. I have decided to keep those shares for now and simply quit reinvesting the dividend. I am not receiving a 5% discount on the reinvestment price since Vanguard purchases the shares in the open market. I may sell the shares in the Vanguard Roth IRA when and if the price goes over $11.5 and then wait for an opportunity to buy those shares back in the Fidelity Roth IRA. 2. Bought 200 WIW at $11.45 (see Disclaimer): This is a contrarian trade. Security Description: The Western Asset/Claymore Inflation-Linked Opportunities & Income Fund (WIW) invests mostly in U.S. treasury inflation protected securities, weighted at 73.6% as of 9/30/14. The fund also owns some corporate bonds. The fund is able to pick up some yield by investing in high yield corporate and emerging market bonds plus a small weighting in foreign sovereign bonds. The fund had a small weighting 8.3% in non-U.S. inflation protected bonds; 9.25% in emerging markets; and 8.99% in junk. The fund was leveraged as of 10/24/14 at 26.23%, according to the sponsor. That leverage adds risks, while possibly creating a modest increase in yield given the narrow spread between the cost of borrowing and the yields provided by bonds purchased with borrowed funds. Since this bond CEF is weighted in TIPs, the current yield will be low. The lower current yield, compared to non-inflation protected treasuries or corporate bonds, is the trade off for the inflation protection. At a total cost of $11.45 per share, the yield would be about 3.51%. At least that yield is better than the .01% paid by the money market fund used to fund this purchase. Snapshots of IMF realized gains can be found in the last linked post and total $404.5. Rationale: When and if inflation starts to become a problem, the cost of inflation protection will go up, probably before I would notice it or attribute the change to a fundamental shift in a long term outlook rather than a temporary aberration. WIW is selling an attractive discount as noted above. If I am caught holding WIW for the long term, I am fine with that result. Prior to this last purchase, I did not own any TIPs, directly or through a TIP fund. Risks: A treasury inflation protected security will not protect an investor from a rise in rates due to interest rate normalization rather than to an increase in inflation and inflation expectations. As the comparable maturity non-inflation protected securities started to decline in price and rise in yield last year, the TIPs did the same. The TIP ETF had a -8.49% total return in 2013. Inflation and inflation expectations have been trending down. Thus the accretion in the TIP's principal amount resulting from inflation has been declining too. 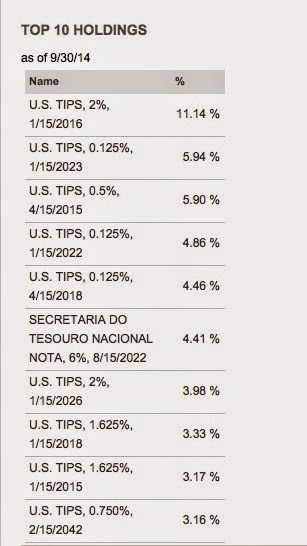 When I sold my individual 10 year TIPs in 2012, the purchaser acquired bonds that had a negative yield of -.89%: Item # 1 Sold 3 TIP Bonds Maturing in 2019 at $120.45 I calculated at the time that my profit of $838.87 (see snapshot) would likely exceed the interest payments and principal accretion from CPI until maturity on 7/15/2019. I was then receiving less than $60 annually from that TIP with a 1.875% coupon purchased at auction. Needless to say, the pricing of that TIP at a -.89% current yield made no sense and was in my opinion the bond market equivalent of 1999 stock valuations. In addition, a bond CEF carries its own risks as to pricing. There is nothing to prevent investors from dumping shares and causing the discount to expand further after a purchase. While there would seem to be a rational limit on such an expansion, there is in reality an indeterminable one. The most severe crunch came in October 2008 when bond CEF discounts went over 30% and briefly over 40% in some cases. The sponsor lists a variety of well known risks at its webpage, including a very long summaries relating to interest rate and leverage risks. For anyone unfamiliar with those types of risks, they can be read by clicking "risks and other considerations" near the top of the main sponsor's page for WIW. Future Buys/Sells: For a low yielding CEF like this one, I need to successfully exist an existing position before buying more shares. I do not have a target price. A narrowing of the discount to 12%-13% with some slight net asset value appreciation, plus a few monthly dividend captures, might be sufficient to trigger a sell. I am no longer in a capital accumulation phase. My key investment objectives are capital preservation and income generation. I started to buy stocks in the late 1960s. I have a balanced worldwide portfolio with a considerable allocation to cash. Starting in December 2016, I started to reallocate out of cash and into high quality short and intermediate term bonds and FDIC insured CDs using a ladder strategy. I have been paring my stock allocation, selling gradually into the robust stock market rally occurring since the U.S. election. In this blog, I will be discussing only a sample of my recent stock trades. I will be discussing almost all of my bond and CD trades. I am not a financial advisor but simply an individual investor who has been managing my own money since I was a teenager. In this blog, I am acting solely as a financial journalist focusing on my own investments. The information contained in this blog is not intended to be a complete description or summary of all available data relevant to making an investment decision. Instead, I am merely expressing some of the reasons underlying the purchase or sell of securities. Nothing in this blog is intended to constitute investment or legal advice or a recommendation to buy or to sell. All investors need to perform their own due diligence before making any financial decision which requires at a minimum reading original source material available at the SEC and elsewhere. For purchases of bonds and preferred stocks, the prospectuses need to be reviewed until fully understood by the investor. DIFFERENCES IN PRICES AMONG BROKERS FOR DIVIDEND REINVESTMENTS.